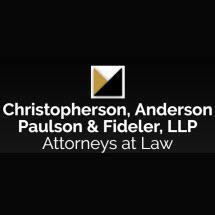 Christopherson, Anderson, Paulson & Fideler, LLP, has served the citizens of Sioux Falls and the surrounding areas since 1894, five years after South Dakota became a state. Although the names and faces at our firm have changed over the years, our commitment to providing exceptional client service has never wavered. We are experienced legal professionals who offer customized, comprehensive advice throughout life’s many stages. Although our areas of practice are many, you will always work one-on-one with an attorney who has the practical experience to overcome the challenges you face. We will work diligently to obtain a solution tailored to the specifics of your case. At whatever legal crossroads you find yourself, we can help. To discuss your case with our law firm, please call our office in downtown Sioux Falls at 605-679-6745 to schedule a free initial consultation.